GLENN PEARSALL has combed through long shelves of published works about early development efforts north of the Mohawk. The result is a thought-provoking book about selected (on what basis is never clearly explained) episodes in North Country history, covering the years roughly between the end of the American Revolution and 1820. The stories he tells are presented vigorously and convincingly, with deft deployment of telling detail and dramatic anecdote. Although there is much to admire in When Men and Mountains Meet, there also are problems, most of which are the typical but by no means inevitable consequence of unedited self-publishing. For example, the documentation system is inadequate: substantial ideas, including the extensive research of others, is poorly acknowledged or not acknowledged at all. The intended meaning of “cultural history,” a term introduced in the preface as part of the rationale for the whole exercise, is unclear. Many readers would assume that “cultural history” engages literature or the arts or perhaps that it explicates “culture” in the anthropological sense, analyzing a society’s values, rituals, and shared understandings; neither is the case here. Among other gaffes, Pearsall claims that Theodore Roosevelt signed the 1872 legislation creating Yellowstone National Park. Roosevelt turned fourteen that year. All of these shortcomings, along with haphazard punctuation, undocumented claims, and other minor problems, reflect the current fad for self-published history. For many writers, self-publishing offers a great opportunity, but every manuscript needs both a meticulous copy editor and readers willing to point out problems with substance or clarity before they reach print. The virtues of the best of self-publishing are also on display here: enthusiasm, sharp writing, and good storytelling. When Pearsall gets down to individual cases, he hits his stride. The first of these (largely a crisp summary of Edith Pilcher’s 1985 Castorland: French Refugees in the Western Adirondacks, 1793-1814) rehearses the interesting saga of French aristocrats fleeing the horrors of the French Revolution and dreaming of starting a new life in the American wilderness. The tale is neatly told, with apt quotations from journals of the participants, illustrating the hardships of traveling through the wilderness, especially for people with absolutely no prior experience with the realities of the dense forests of New York. It’s a story of baseless optimism, grandiose plans, and financial failure. A subsequent chapter recounts another aristocratic French effort—this time of the LeRay family of Nantes—to develop the wilderness west of the Adirondacks. This one absorbed the failed Castorland experiment and embraced hundreds of thousands of additional acres, including vast swaths of Lewis, Jefferson, Franklin, and St. Lawrence counties. One significant residue of the LeRay adventure was the magnificent LeRay mansion built just east of Watertown. This mansion burned in 1822 and was rebuilt. It is now part of Fort Drum. With the story of John Brown of Providence, Rhode Island, and his dreams of prosperity for a settlement around what is now Old Forge, Pearsall finally gets into the Adirondacks. In 1795, Brown, member of a hugely wealthy family from Providence, much of whose wealth derived from the transatlantic slave trade, acquired title to over two hundred thousand acres of land in the southwestern Adirondacks. This was the beginning of yet another painful exercise in investment, labor, and, ultimately, financial collapse. On his Adirondack lands, which, Pearsall notes, were dubiously acquired, through steps that remain murky, Brown tried to establish a settlement. Through his agents, he had a dam built on First Lake and began the rudiments of a village, with a clearing, a few houses, and grist and sawmills. All this development demanded major inflows of capital. The last known picture of Herreshoff Manor before it burned in 1896. When John Brown died in 1803, much money had been spent, but there was little to show for it. His heirs took up the cause and poured in more money and energy. In particular, Charles Frederick Herreshoff, who had married Brown’s daughter and who had already frittered away much of his wife’s inheritance, tried to redeem himself by turning the Adirondack property into a lucrative investment. In 1811, he threw himself into a hopelessly ambitious scheme to generate revenue, building mills, clearing pasture, laying out roads, and erecting a grand house, which became known as Herreshoff Manor. The mansion, which decayed and deteriorated, was burned in 1896. It sat about a hundred yards west of where the railroad depot is today in Thendara. He attempted, unsuccessfully, to raise sheep, and weather doomed most of his crops. His final stab at making a go of his Adirondack property was an iron mine. He explored what seemed a promising vein and put more of his family’s money into a forge. But debts were mounting, and the iron scheme collapsed. One day in December 1819, he put a pistol to his head and ended it all. Within years, the nascent settlement was deserted. It was another chapter in a series of failures on the Adirondack periphery. This is a sad but engaging tale, well told by Glenn Pearsall. With the same attention to detail and with a fine sense of drama, Pearsall describes the colorful and strange tale of how Napoleon Bonaparte’s brother Joseph tried to create a North American sanctuary for his defeated emperor on the site of the failed Castorland adventure. Napoleon, as we know, never made it to the Adirondacks, but Joseph did. He had bought the LeRay property and actually visited it in 1817. It seemed appealing, and he commissioned the construction of several elaborate houses. About all that remains of this affair are the name of Lake Bonaparte in St. Lawrence County and the Benton Bonaparte house in Oxbow. Further chapters retell other failed adventures on the outskirts of the Adirondack Park. All have been told before by local historians, but this volume brings them together for the first time. These include the Fredenburg settlement near Plattsburgh, the early efforts to develop veins of iron ore near Lake Placid, and settlements along Lake Champlain, a significant remnant of which is the cluster of lovely early nineteenth-century homes and churches in the town of Essex. There’s an interesting chapter on logging around the Schroon River, (with photographs from a period much later than the events described). The town of Johnsburg gets a good chapter, though it’s unclear to me why we need several pages covering events in eighteenth-century Manhattan. In the concluding chapter, Pearsall argues that the main reason these many schemes failed to produce the fortunes their designers hoped for was the completion of the Erie Canal in 1825. It’s true that the canal funneled commerce and settlement toward the Great Lakes, but surely climate, topography, and the difficulties of transportation are at least equally responsible for the fact that early developers did not realize their dreams near or in the Adirondacks. The boom years never came, although at the end of the nineteenth century lumber barons, mostly based outside the Park, did accumulate great wealth. 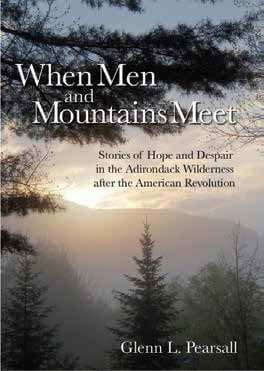 The final chapter, “The Adirondacks as Wilderness,” descends into impenetrability. This chapter focuses, but does not shed much light, on the controversial and much discussed problem of what wilderness means, whether it should it be protected, and what its protection means with respect to local economies. This discussion adds nothing to what many others have already said, deals in sweeping and unsubstantiated generalizations, and mostly repeats the tired and unsupported argument that wilderness preservation and the zoning strictures of the Adirondack Park Agency are thwarting economic development in the Adirondacks. It also seems oddly divorced from everything that precedes it. While one should certainly have sympathy for those families struggling to make a living in our Park, failing to recognize that similar rural regions throughout the country, including many without anything similar to our Forest Preserve or regional zoning authority, are enduring equal if not far worse hardships is disingenuous. In any case, no useful connection is established between the stories of early nineteenth-century failure, so deftly told in the central chapters of this book, and twenty-first-century economic travail.